The YAMAL LNG facility, located in Sabetta on the Yamal Peninsula in Siberia, Russia, is an integrated project including natural gas production, liquefaction, and shipping. The project consists of a LNG plant with an output capacity of approximately 16.5 million tpy, and utilises the South Tambey Field (with reserves are estimated at 926 billion m3) as a resource base. The plant is designed and commissioned by the consortium of TechnipFMC, JGC Corporation, and Chiyoda. 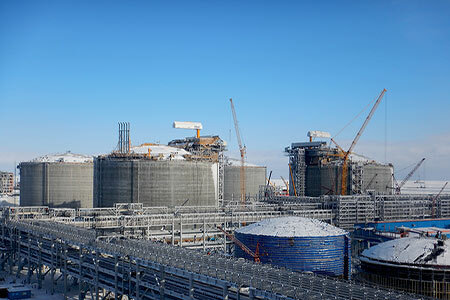 The Yamal LNG plant will feature three trains with total capacity of 16.5 million tpy of LNG. The first train was operational in December 2017, and full capacity will be achieved by 2021. Yamal LNG has commissioned 15 LNG icebreaker/tanker ships to export its gas. Figure 1: The Yamal LNG plant will feature three trains with total capacity of 16.5 million tons of LNG per year. The LNG plant is being built in three phases which are scheduled for 2017, 2018, and 2019. Because the location experiences a harsh environment with the difficult construction conditions of a polar climate, modularised construction methods are being used to reduce costs and speed up construction time. Sections of the construction were completed in module yards across Europe and Asia. Using this method enabled the contractors to prefabricate installations in locations where the working conditions were much better, and sections could be shipped to the Yamal project site for final installation. The Yamal Peninsula is located in the Arctic Circle; the climate is cold with ambient temperatures that can drop as low as -52ºC. The natural gas is collected from deep below the permafrost and goes through a series of processes to form LNG which is transported by LNG carriers to terminals all over the world. The choice for an adiabatic system with no heat loss or gain that would meet both the required technological conditions and that would withstand the extremely harsh conditions of the Arctic had become a challenge to the project team. Figure 2: Despite the sunshine, the Yamal Peninsula is located in the Arctic Circle, and the climate is cold with ambient temperatures that can drop as low as -52°C. After six months of rigorous screening and comparing various factors including company qualification, product performance, technical reliability, and service capability, YAMGAZ (consisting of TechnipFMC, JGC, Chiyoda General contractors, module builders, and insulation subcontractors) chose FOAMGLAS® cellular glass insulation, manufactured by Pittsburgh Corning, as the thermal insulation material for the Yamal project. All installed systems would consist of FOAMGLAS® insulation in combination with Pittsburgh Corning accessories which include adhesives, sealants, and finishes (such as jacketing, coatings, and wraps). 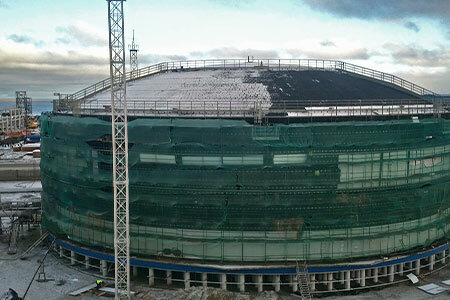 The YAMAL project has a thermal insulation system workload of more than 1 million m² with the biggest part being completed in modules and after completion shipped to be installed on site. FOAMGLAS® insulation was chosen as the insulation material for all cryogenic piping and equipment for the YAMAL project. To date, numerous containers of material have been shipped to module yards all across Europe, the Philippines, Indonesia, Russia, and China. FOAMGLAS® insulation systems were installed on all piping and equipment for cryogenic service to guarantee a continuous process with a constant thermal efficiency once installed and operating. Figure 3: FOAMGLAS® insulation systems were installed on all piping and equipment for cryogenic service to guarantee a continuous process with a constant thermal efficiency once installed and operating. There were a couple of reasons for choosing a FOAMGLAS® insulation system for the cryogenic service piping and equipment. FOAMGLAS® insulation is all glass and 100% impermeable to moisture which can lead to the formation of ice. It also expands and contracts at a very similar rate to steel, thereby avoiding movement that can cause cracks and open joints. Another reason it was chosen is that it cannot burn and will not absorb flammable liquids. This is critical in the presence of hydrocarbon products. Additionally, FOAMGLAS® insulation prevents heat exchange between the pipes and the plant structure which is important for the efficient operation along the LNG value chain as thermal exchange and the resulting temperature increase of the tanks and pipes would increase the energy required for cooling the liquefied gas. 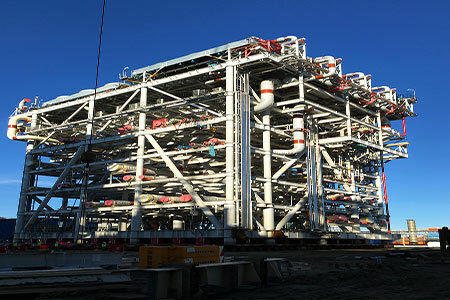 A great number of modules featuring pipe racks with piping and equipment protected by FOAMGLAS® insulation were constructed at module yards over the years and shipped on heavy lift ships to the Yamal LNG site for onsite installation. In May 2017, the final LNG core module set sail from Qingdao to the North Pole, allowing the YAMAL project’s global distribution of modules to be completed three months earlier than originally planned. Pittsburgh Corning was able to supply all insulation contractors without any issues by relying on their worldwide supply chain with factories across multiple continents. This global footprint enabled quick turnaround times, global production planning, manufacturing close to the project site, and worldwide technical support. 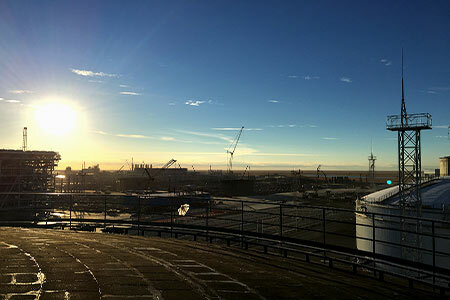 An important part of the Yamal project was the construction of four LNG storage tanks, each with a capacity of 160 000 m³. These double containment tanks have a diameter of 80 m and measure more than 40 m in height. Since the 1960s, tank builders worldwide have trusted FOAMGLAS® insulation as a core component in tank base insulation systems, and today thousands of hot, cold and cryogenic tanks are supported by FOAMGLAS® insulation tank-base systems. In fact, FOAMGLAS® HLB insulation is a core component in over 90% of the world's LNG tanks base insulation systems, a critical application requiring high-load-bearing capabilities in combination with thermal insulation properties. FOAMGLAS® insulation was used for the insulation of the tank bases, tank walls, and tank roofs. The bases were insulated with a high load bearing insulation system with a compressive strength of about 160 t/m². A FOAMGLAS® HLB tank insulation system provides constant high compressive strength, protects the structural material against extreme temperatures, will not absorb any flammable liquid and is also chemically resistant to the stored liquid. Pittsburgh Corning delivered close to 8000 m³ of FOAMGLAS® HLB insulation for the tank bases alone. Figure 4: A FOAMGLAS® HLB tank insulation system provides constant high compressive strength, protects the structural material against extreme temperatures, will not absorb any flammable liquid and is also chemically resistant against the stored liquid. The tank risers for each of the tanks were also completely done in FOAMGLAS® insulation, all mechanical and insulation work was executed at a module yard in Kaliningrad, Russia. The risers were built in modular horizontal constructions that consisted of piping with a multiple-layer FOAMGLAS® system that was finished with a butyl wrap and stainless-steel cladding. These constructions were loaded on vessels for sea freight shipment and shipped to the Yamal site in Sabetta for installation alongside the four LNG tanks. Pittsburgh Corning Europe also provided onsite support by sending one of their technical services engineers to the Kaliningrad site to train local insulators and to assist with the initial start-up. Pittsburgh Corning’s FOAMGLAS® Global Training Team offers a variety of education and training opportunities for all those involved in specifying, procuring, or installing FOAMGLAS® insulation systems. Industrial fire safety is more important now than ever before. Production demands require oil and gas facilities to run continuously without fear of costly safety issues. An LNG pool fire is considered one of the main hazards of LNG, together with LNG vapour dispersion. To address these needs, Pittsburgh Corning provides the FOAMGLAS® PFS™ pool fire suppressant system. This system complements any safety program by delivering a reliable, low-cost, low-maintenance, passive solution for the reduction of thermal radiation and flame height in contained LNG fires. The FOAMGLAS® PFS™ system is easy to install and can provide immediate mitigation of the thermal flux, rate of combustion, view, and overall size of an LNG pool fire. The FOAMGLAS® PFS system consists of prepackaged dispersal units that are constructed using multiple pieces of FOAMGLAS® insulation, shrink wrapped, and covered in UV resistant polyethylene bags. When the FOAMGLAS® PFS Pool Fire Suppressant units are in place during an LNG pool fire, the polyethylene bag and shrink wrap are consumed, releasing the individual pieces of FOAMGLAS® insulation which float on the surface of the liquid. As the pieces of insulation spread over the surface of the LNG, the surface area available to the fire for burning is reduced. Flame height and thermal radiation is reduced as a result. Pittsburgh Corning delivered close to 65 000 PFS units to the Yamal LNG site which were installed in various LNG and LPG pits located around the storage tanks. The beginning of December 2017 marked a milestone for the project as Yamal LNG began producing LNG at the first LNG train and shortly after, the first LNG cargo was loaded onto the first LNG tanker at Sabetta port. The loading of the first LNG cargo was a real testament to the tremendous efforts of all project partners, contractors, and all parties who contributed to delivering the Yamal LNG project on time and on budget. They all contributed to building a LNG project in extreme conditions to take advantage of the vast gas resources of the Yamal peninsula. With FOAMGLAS® insulation protecting the piping and equipment, system designers expect many years of problem-free performance in this harsh environment. This is an article written for LNG Industry’s March issue and abridged for the website. Subscribers can read the full March issue by signing in. Non-subscribers can access a preview of the March 2018 issue here.